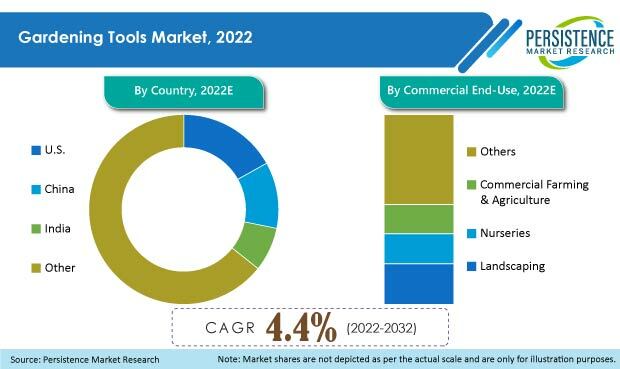 The global gardening tools market is estimated to be valued at over US$ 4,200 Mn in 2017 and is estimated to be valued at nearly US$ 5,380 Mn by 2025. The gardening tools market is anticipated to create total incremental opportunity of US$ 1189.8 Mn between 2017 and 2025. The market is expected to register a value CAGR of 2.8% over the forecast period and is anticipated to witness relatively higher value growth in the second half of the forecast period. The rising DIY attitude among people is a factor contributing to the rise of the gardening tools market. The availability of various multipurpose tools with ergonomic designs has led to the rise in demand for gardening tools in North America. As per U.S. government rules and regulations, community garden plots are also considered as an important part of the society, and thus, the use of these gardening tools favors market growth. The availability of modern designed tools for various sizes of gardens facilitates users to opt for different gardening tools. Tightened rules and regulations regarding periodic maintenance of gardens in private and community premises creates preferences for gardening tools in the DIY market. Gardening is considered to be a leisure activity; further with increasing consumer spending capability and per capita disposable income, increasing expenditure on leisure activities is expected. People spend time and money on gardening and gardening tools in order to keep up to a standard due to social pressure. Considering the increase in spending on gardening and lawn care, the gardening tool market in APAC has shown favorable demand. People hire professional gardeners and high-end garden tools in order to maintain their gardens. Households growing a small amount of vegetables on roof tops have increased, and this has led to an increase in the use of gardening tools in the APAC market. End users prefer power tools over hand tools, as they are relatively easy to operate, and also help save on time. Power tools generate extra power for the execution of any task as compared to hand tools. They are used by home and professional gardeners alike to reduce the workload. Power tools provide speed and an advantage of scale; for instance, to cut through a large tree trunk, using a hand saw would be a slow process, whereas, a chainsaw gives the logger the speed and control they need. The pruning tools segment is anticipated to hold almost 32% share of the gardening tools market in 2017 with a CAGR of 2.9%. Though the pruning tools market is expected to generate highest incremental opportunity, the growth rate is comparatively low. The digging tools segment is expected to grow at a stagnant pace creating limited investment opportunities for new players. Simply put, urban green spaces are those spaces in the city that are covered by vegetation or other soft and permeable surfaces. The interest in urban green spaces appears to be growing, and many cities are experimenting with innovative ways in order to bring urban greenery into the cities. Cities are creating greener spaces in order to create more comfortable and environment friendly places to live in. In North America, the interest for urban green spaces appears to be on the rise. Chicago and New York are already at the forefront of urban green space innovation.